Having a great barbecue means more than a mean steak or some grilled chicken. You've got to fill the other half of the plate with something. Enter these three tasty and easy to pull off side dishes that will really prove your grill mastery. Summer is here and the time is right for grilling in the yard. Every night the aroma of meat cooking over an open flame overwhelms your neighborhood, and it’s time that you got in on the action. There is always the quick and easy option of hamburgers and hotdogs, but let’s be honest, anyone can do that. A man should not be afraid to go outside of his comfort zone, particularly when it comes to cooking. Now that you know your grill safety and how to light a charcoal grill, we here at Primer have come up with a crash course in grilling that begins with side dishes..
No meal is complete without a decent side dish. Many grillers either forgo the sides or just toss some rice in a pot on the stove. That’s fine every once and awhile, but why not show off your manly grilling prowess by whipping up your sides on the grill along with the main course? Mix garlic, salt, olive oil, vinegar and black pepper in a small bowl. Chop the peppers. I usually go with a mix of rings and strips. Put peppers in a large sealable bag and pour in your marinade. Shake it up so all of the ingredients can become friends. Marinade for a few hours. 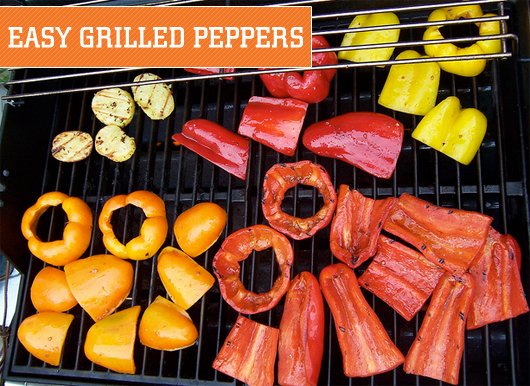 Put peppers, smooth side down, on the hot grill. Cook until you have some decent grill marks on each side, roughly eight minutes. Sprinkle a little Feta on top and enjoy! Put large saucepan with water on high heat. Peel and slice potatoes, about finger thickness. After water is at a slow boil, add potatoes, boil for about 7-10 minutes. Combine EVOO, garlic, thyme, and a bit of salt and pepper in a large mixing bowl. Remove the ‘taters while still firm and toss in the bowl with the seasonings. Grill, turning once, remove once you have decent grill marks. Brush both sides of bread with EVOO. Mix all ingredients (except cheese) and spread evenly over the breads. Top with cheese and drizzle with more EVOO. Grill on low to medium heat until cheese melts (don’t burn the bottom). There you have it! Three tasty side dishes cooked on the grill. Check back soon for three of the simplest and most delicious meat recipes for the grill you will ever have the pleasure of tasting. Love the Tuscany bread idea – put that Boboli to good use. It all looks delicious. You can through eggplant as a simple and awesome addition to the pepper recipe. Slice it to around 1/4″, drizzle olive oil, add salt and ground pepper, throw it on the grill and you have a very awesome appetizer. Yeah, the bread is killer. I would also recommend grilling zucchini brushed with olive oil and a little salt. It’s fantastic and easy, but will make you look like you know what you’re doing. Side dishes often come as an afterthought unfortunately… but the seasoned cook knows that they make or break a dish. Good post.